Alex Souza is the founder of Kwiksher, a photoshop plugin for publishing illustrated, interactive storybook apps. I met him when he was hosting #storyappchat on Twitter for us back in 2011 & again last summer and he’s a great resource, even for those not interested in Kwik specifically. Check out his blog, including articles like, “Want to create a storybook? Do your homework first!”. Like many people, I always dreamt of having a published storybook. However, knowing how hard it is, I decided to leave the idea for “the future”. Fast forwarding time, the future arrived in the format of tablets and apps that could be published, by anyone, in a matter of seconds. As you can imagine, my list pretty much blocked all available tools, at least at that time. They all either required web access for content submission, were limited in animations and/or required revenue sharing throughout, with in-app purchase only. At that time, I was studying a new development tool (called Corona SDK), with the idea of creating a personal app. Also, I knew how to write a few lines of code and was able to work with Photoshop. Still with my storybook idea in mind, I decided to learn how to create a plugin for Photoshop that at least could export the layer positions into Corona code. This way, every time I needed to reposition a layer of content, I wouldn’t need to re-enter all the size, transparency and positions into the code. With that done, I then decided to code a way to control page changes. Then I went to code a basic animation system. Then … my personal project became Kwik, a Photoshop plugin that allows graphic designers, illustrators and well, really anyone to create rich interactive storybook apps in Photoshop for iOS and Android without knowing code. Since it launched in May of 2011, thousands of users (most of them “do-it-yourself” people), have created more than one hundred storybook apps (you can check some of them in our Showcase), the large majority without any code! What are the Pros & Cons of Kwik comparing it to other tools? Kwik is a Photoshop plugin. You must have and know how to use Photoshop basics in order to get the full benefit of both products. 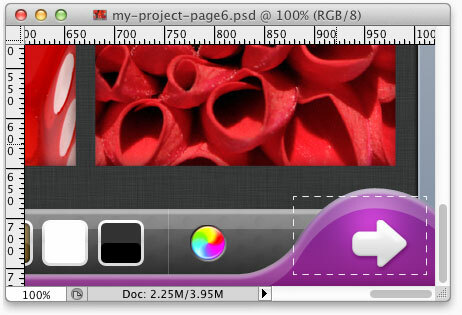 Being an extension of Photoshop, Kwik uses native features that all other tools do not have access. For example, it creates all the image layers for you, tracking their position, sizes, etc. No need to import images and redraw your entire compositions in another tool. Also, you can work offline because you don’t need to upload images to an external website. Because Kwik is a Photoshop plugin, you must have and know how to use Photoshop in order to get the full benefit of both products. If you are not a Photoshop user, it may be expensive (time and money-wise) to purchase and learn Photoshop. Although Corona can build apps for different stores, you must learn how to get your membership and how to create personal certificates for each app you create. The moment you learn how to do it, it is fine, but, be prepared to spend some hours getting frustrated with the complexities of each store’s requirements. So, is Kwik for me and can I really create a storybook by myself? If you are already a Photoshop user or are willing to learn it to get full control of your content, short answer is YES! The simplicity of the task is directly affected by the quality you plan to have. For many current users, they start simply and get their first app published in a matter of weeks. Better apps, offering not only good story lines, but also, gorgeous illustrations, amazing sound/music, and interactivity that extend the story … these take longer to develop. If this is what you are looking for, it will be well worth your time to learn a plug-in like Kwik and gather the appropriate resources for your project. Kwik is not for people wanting to create storybooks in a day or two. Its beauty resides in the things no other tool can offer: the ability to add your personal touches to each page, extending the native features in order to create something that will only exist in your storybook. You must be committed to learn (and honestly, to create more than one app). Think of Kwik as your personal developer. You tell it the right things and your app will shine against the competition. Alex is the founder of Kwiksher and no stranger to application development. He worked previously for IBM and Microsoft, creating applications for their customers and marketing products like Microsoft Office, Expression and Silverlight. As a pioneer of web design in Brazil he was the first developer of a Shockwave game in that country in 1995. In 2000 Alex was a runner up for the iBest Top 3 award (Official and Popular Jury) which is the most important internet award in Brazil. Alex holds a bachelor and master degree in Digital Design and has been a sought after speaker at conferences like Publishing App Expo in 2011, MIX 2010 in Las Vegas, and several international MIX events in Mexico, Argentina, and Brazil. You can contact Alex on his blog or via Twitter – @Kwiksher.